Most people follow only 3 of Paul's recommendations. Too many ignore the most important one – networking. Many times, people attend a conference and not network with a single new person. They might nod to the person next to them in a class, but they don’t take the opportunity to get to know them. 1. Have a positive attitude. People like to meet upbeat people. If you display an attitude of confidence and resolve, people will want to talk to you. Watch what happens in any room. People are drawn to those who look like they belong, who look like they're happy to be there. They aren’t attracted to people who have what I call "Eeyore Syndrome." You remember Eeyore, don’t you? He’s the donkey from the Winnie the Pooh stories. Remember how he was always in a gloomy mood? No matter who came up to him, and whatever their mood was, his response was always, "Oh well". I mean even when Tigger came bouncing up (because that's what Tigger's do best), what did Eeyore say? "Oh well." Do you want to hang out with an Eeyore? No, you want to be around people who are upbeat and confident. People who know what they want. Remember, confidence and resolve, not egotism and stubbornness. Positive, not overbearing. 2. Look people in the eye when you’re talking to them, and more importantly, when they’re talking to you. Don't be looking around the room for someone else to talk to. Give the person in front of you visual signals that you’re listening to what they’re saying. Nod your head if they say something you agree with. Smile when they say something humorous. Let them know that they have your attention. 3. When talking with someone, look for the ways you’re similar, not different. Pick up on what the person says that is in common - directly or indirectly - with you. Acknowledge that you can relate to what they're talking about. If they mention the Eeyore Syndrome, let them know you love the Pooh stories. Ask them who their favorite character is. (Who's your favorite character? Mine's Edward Bear.) Use the conversation to connect, not separate. 4. Years ago, I met Rod Walz. Rod invented one of the first automated certified mailers, and I hope to see him again at the National Postal Forum this year. Rod said to be remembered, be interested, not interesting. Don’t try and impress people with stories of your own achievements. Don't try and show how smart you are, or how interesting you are. Let them have the spotlight, and show an interest in what they’re talking about. Ask questions about their area of interest or expertise. Find out why they're interesting. Be the audience for a while. 5. Your mother was right, politeness counts. Show respect to the people you’re talking to. "Sir" and "Ma'am" are still appropriate, no matter what century we're living in. Don’t use off-color language or tell risqué jokes when you're meeting people. Never put down anyone else – any person, any race, any religion, or any nationality. You don’t know who you may offend. This isn’t political correctness, it’s politeness. Oscar Wilde once said, "A gentleman never hurts someone's feelings, unintentionally." Be a gentleman, be a lady. And if you hear gossip, please don’t repeat it. 6. Follow up. Meeting people is only the first step in networking. It's the seed you plant. And you must cultivate the seeds in the garden that is your network in order for it to grow. You must follow-up. You can follow-up with emails or a letter, maybe even a hand-written letter, after meeting someone. If you aren't following up, you aren't networking. Some people aren’t comfortable in social situations, or introducing themselves to strangers at a conference or other event. They may be shy, introverted or uneasy in large groups. But we must remember that there are people who want to meet us. 1. Don’t go alone. Attach yourself to someone that is already a good networker. Walk with them as they work the room. They’ll help you meet new people. I started this article quoting advice from Paul Balbastro. In the world of mail, Paul is the absolute best networker. I've been told that the Postmaster General calls Paul to find out the scoop on the industry. This guy is connected. When I started attending national conferences, I always hung out with Paul. Through him, I met more people, and developed the skills, and more importantly, the confidence to network on my own. Find a Paul Balbastro. 2. Practice. Remember, this is a skill. Before going to an event, remind yourself that you’re going to network. Prepare yourself for going up to people and introducing yourself. Preparation doesn't make networking any less authentic. 3. Listening is good. If you’re by nature a quiet person, that’s okay. Remember the mantra – be interested, not interesting. People love to hear the sound of their own voice. And if you can be their audience, they’ll thank you for it. They'll remember you for it. They'll love you for it. 4. Remind yourself – networking is a survival skill. You have to do it. There are no guarantees in life. You are going to come up against problems and difficulties where you will need help. If it’s 3 o’clock in the morning, and the water pipes have burst, that isn't a good time to start looking for a reliable plumber. If tomorrow your boss tells you your job has been eliminated, that isn't a good time to start building connections to your next job. 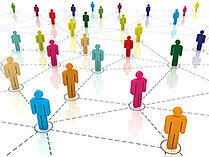 Build your network now. 5. Remember, you are the only you, and the best you in the world. You bring something special and unique to other people’s networks. They want the opportunity to meet you, and learn more about you. I want to meet you and get to know you. That will only happen if you network.